Finally! The moment we have all been waiting for. Adorable hotel room service robots that politely “bleep” and “bloop” at you. They even have animated blinking eyes! Recently, the Aloft in Cupertino, California unveiled a “butler” named A.L.O. 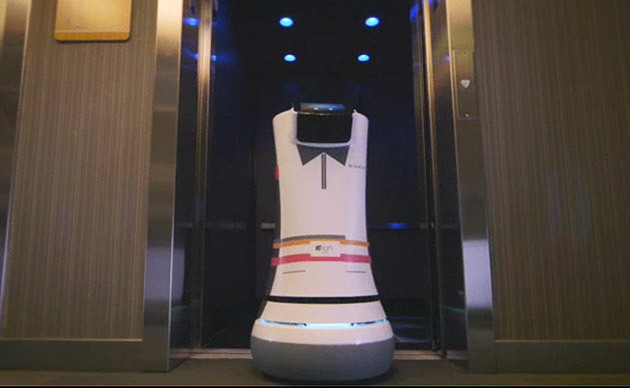 Botlr (think “robot butler”) which has been programmed to help out guests staying in it’s building. Equipped with a 7-inch tablet, 4G and Wifi connectivity that reportedly can even call an elevator for itself, it can carry loads of up to 10 pounds. The only thing it asks for in return is for you to tweet the hashtag “#meetbotlr”. We welcome our cute, adorable and bowtie sporting robot overlord. Subscribe to our monthly newsletter below where we share web development, design, user experience and web marketing information!